Q: Tell me about how you got started doing this work. It’s a personal journey. I was born in Mexico City. My parents are from the United States and I just have had the great luck and fortune of having exposure to Spanish and English on a daily basis from birth through high school. And that meant I learned how to read and write in Spanish and in English at the same time. And it was a really smooth, natural thing. Nobody thought it was a big deal. 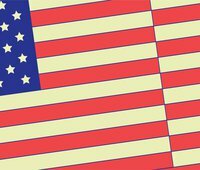 When I came to the United States for college, the term bilingual was associated with remedial programs and it was a real shock for me especially when I became a Chicago public school teacher in the late ‘80s and the bilingual kids thought that there was something wrong with them because they were in the bilingual program. That’s certainly where my passion was born in terms of serving and working with children of immigrants and the population of ELLs and really looking at them through a strength-based perspective as opposed to a deficit based perspective that has been the status quo for so long. What was interesting to me as I became a professional is that I was taught that sequential literacy was the approach to use with all students — whether they are ELLs in a bilingual program, or native English speakers in a two‐way immersion program. At the time, in the ‘80s and the ‘90s, the research we had was based on sequential literacy...the idea that all students have a dominant language and that you needed to learn to read and write in that dominant language. Once you have a strong foundation in that dominant language, then you were ready to transfer your knowledge from your dominant language to your second language and that typically happens at around the second or third grade. And so that’s the practice I followed as a teacher and as a principal of a DL school in the ‘90s. It felt like we were doing the right thing. Then I started on this book project and my colleague Cheryl [Urow] and I started to read about all the latest research and we realized that we were very entrenched in this monolingual perspective. Q: What does it mean to have a monolingual perspective of language learning versus a multilingual perspective? The monolingual perspective assumes all students have a dominant language and many decisions of course follow: assessment is done in one language, you plan for one language, you keep the two languages separate. When students do wonderful things like say, “me han mojado mi sockatines,” you know they took socks and calcetines and made a new word out of it. Or they use U.S. Spanish like “Estoy estoquiado.” They don’t know how to stay stuck in Spanish, so they take stuck from English and push it into Spanish. The monolingual perspective looks at students as low in both of their languages when they do that. On the other hand, the multilingual perspective assumes that students’ knowledge is shared across two languages and it challenges the notion that all students have a dominant language. That’s really where my understanding of biliteracy was born. It was born in that multilingual perspective. The idea is the following: often when students are labelled as ELL, what they know is shared not only in Spanish, but also in English. Therefore the idea of teaching them to read only in one language makes no sense because instead of building on the linguistic resources they have in both their languages, it takes us down that deficit model of only teaching them to read in one language. Q: How do you define biliteracy in your work? My definition is very simple. I go with the definition of monoliteracy first. Monoliteracy develops the ability to read for understanding. It’s all about meaning. It’s all about comprehension. And when I work with teachers, I have them really unpack that. I have them figure out how to use comprehension, reading, writing, word study and listening and speaking (oracy). Those are the fundamental elements of literacy but what I emphasize with them is that just knowing how to decode and knowing foundational skills, does not make you literate. To be literate means to both decode, apply skills and understand. And that’s really, really, really important because, for example, in this era of accountability a lot of first graders don’t read for understanding, they just decode and everybody thinks they’re reading. And we’re setting ourselves up for a lot of challenges later. So that’s the definition of monoliteracy. 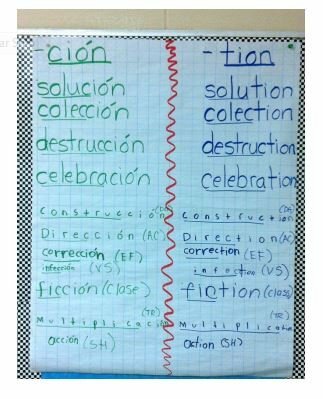 Biliteracy is the ability to read for meaning using appropriate comprehension, reading, writing and word study strategies but in two languages within an academic context. So that takes a while to develop. Q: Tell me more about the Bridge and bridging. So when Cheryl and I read the research and we came up with the premises, ((The three premises for teaching biliteracy are: (1) Spanish is a minority language within a majority culture, (2) Students use both their languages for literacy development, and (3) Both Spanish and English are governed by distinct linguistic and cultural rules)) it was in the field with teachers that we developed this notion of the Bridge and we realized we have to challenge this monolingual assumption that’s keeping the two languages separate. We still have Spanish time, we still have English time and then we added on this third space — we called it the third linguistic space — called “the Bridge.” That’s the time where there’s an intentional comparison of language.We look at phonology, morphology, syntax, grammar and pragmatics. 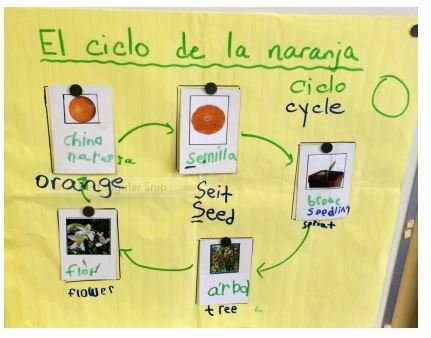 For example, in a kindergarten class, students learned all about the cycle of the orange in Spanish — I always use green to indicate Spanish — and we used Total Physical Response (TPR) and visuals and read about it and we did a lot of Spanish literacy. Then, when it was time to go over the Bridge I used the same realia — the pictures and the motions, we made a motion for brote, for sprout, and for tree and for flower, etc. I just taught them the English to add on to what they already knew in Spanish. For us it’s very important that teachers organize the Bridge, but students actually do it. In our learning, it’s best to do the Bridge at the end of the unit when students have really learned the concept. It’s not a daily occurrence. Because the whole premise is that they have deep understanding and then we add the English side. Kids have to understand on the right, in English. If you have a lot of newcomers you have to do a lot of oracy development in English. Because unless they understand both languages they’re not going to be able to do that metalinguistic comparison. Q: Why is the Bridge such an important part of developing biliteracy? So the Bridge comes out of that multilingual perspective. It’s a true understanding that bilinguals are different than monolinguals. The monolingual perspective looks at bilinguals as two monolinguals in one and it keeps languages separate. The multilingual perspective looks at bilinguals as very different from monolingual people. We’re just different. There’s this third space in our use of language that’s called the Bridge and it benefits everything we do. And so it’s really important for bilinguals to develop their knowledge of how their two languages intersect. In our work with teachers, we’ve actually identified a difference between the Bridge, which we capitalize, we’ve made a noun...it comes out of a unit design, and it’s explicit and it’s teacher‐led. As opposed to what we call bridging — and bridging is spontaneous — it happens all day long, it needs context and it’s when students on their own start to realize how Spanish and English are similar and different. It’s really interesting because teachers report that the more formal Bridges they do, the more bridging kids engage in and it becomes a management issue. Kids are finding cognates everywhere! So they’ll come back from recess and say, “ ¡Maestra! We found another cognate! Energy and energía! ” And they want to run and put it on the cognate wall. And that’s such a great problem. It’s important because if we do a good job of building on the third linguistic space and really building on the multilingual resources of students, they just do better in school. It’s strength‐based, it’s really looking at what kids know and can do as a strength. For example, you have a lot of pre‐K and kindergarten teachers say, “I don’t know what to do with these kids! They don’t know when they’re speaking English and when they’re speaking Spanish! They’ll say things like, “Voy a una party con mi brother.” Right? And I’ll say, “Yeah, that’s perfect for the Bridge!” So there are a lot of reasons for the Bridge and bridging: it makes learning a lot more fun, it builds on student linguistic resources, it’s strength‐based, it matches the current research on how important translanguaging is, and it just really helps students understand their strengths and then when they’re working in English they can go deeper in English and when they’re working in Spanish they go deeper in Spanish. What teachers tell us is that it really validates students who use U.S. Spanish (puchar / empujar) because that’s what people talk about during the Bridge and kids just blossom, they’re so proud of what they can do. This post is part of New America’s Dual Language Learners National Work Group. Click here for more information on this team's work . To subscribe to the biweekly newsletter, click here , enter your contact information, and select "Education Policy."